WCLT - Nature Notes 1/12/2007 - Think you know nature? 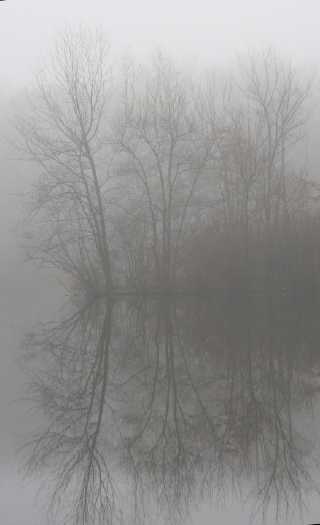 Foggy reflections of bare trees on Gilmore Pond are one of the rewards of a warm winter day. Gilmore Pond is a former farm pond and the headwaters of Jackstraw Brook. The pond is on the trail between Gilmore Farm Road and Isaac Miller Road, on the Charm Bracelet trail system. Thanks to this winter's unseasonably warm weather, the great out-of-doors has been much more accessible than usual for most of us. When the thermometer hit 65 degrees last Saturday, many Westborough residents were outside, doing chores in yards or walking sidewalks and trails. So far, at least, this is not our grandparents' winter. Tune in to nature while you're outside this month. Heighten your awareness of who's who and what's what in our natural environment by taking this year's Nature Notes quiz, which reviews plants, animals, and other sights featured in this column in 2006. As an added bonus, find out what you might see outside right now. An asterisk (*) marks quiz items dealing with sights that are available in the natural world in Westborough in January. For spring, summer, and fall sights that aren't yet available, plan ahead to watch for them in the upcoming year. Remember, if our unseasonably warm weather continues, spring may really be right around the corner! Below you'll find a list of short descriptions of plants, animals, and other sights from Nature Notes columns published in the News in 2006. Match these descriptions with the names in the list of possible answers that follows. *1. It goes head-first down tree trunks while searching for insects. *2. This common critter stars in many stories and is famous for its reproductive rate. *3. It's a feisty loner that hoard acorns. *4. This caterpillar freezes and thaws during the winter, and its pattern is said to predict the winter weather. 5. On the first warm, rainy night of early spring, it sets out for a vernal pool to breed. *6. This raw material for Native American spear points is found on one of two microcontinents that once collided along the Bloody Bluff Fault that runs through Westborough. 7. This garden visitor might be mistaken for a hummingbird, a bee, or a butterfly. *8. It looks like a miniature pine tree and has giant ancient relatives that make up part of today's coal beds. 9. These tiny frogs with an X on their backs make a loud sound. *10. These small wild ducks dive for fish and sport fan-like crests of feathers on their heads. The male's crest has a dramatic geometric pattern. 11. This mushroom digests itself into inky black goo and also traps and digests tiny underground roundworms. *12. This aphid-like insect from Asia is attacking a native evergreen tree in town. *13. This much-loved songbird is a conservation success story, thanks to volunteers throughout the country who set up and maintain a network of specially designed nest boxes. *14. This sociable bird is fond of summer thistles. 15. It's another conservation success story, thanks to nest boxes on woodland ponds and laws regulating hunting. *16. An unusual one of these is white and lives in town. 17. This late-season wildflower of wet places has the name of a reptile, and caterpillars of the Baltimore checkerspot butterfly feed on its leaves. *18. It's usually seen swimming, but it's one of the heaviest flying birds in the world. 19. This small tan butterfly with orange spots on its wings lays eggs on the wild cherry trees in our woods. *20. This night-blooming roadside wildflower is pollinated by moths. *21. It travels in a nomadic flocks during most of the year, is good at finding dried wild fruit on trees in early spring, and doesn't sing. *22. This wetland shrub has small yellow flowers and aromatic leaves and berries, and one kind of swallowtail butterfly lays eggs on it.